On 5th June, hubby and I visited Mount Gassan in Yamagata prefecture. Mount Gassan is the tallest of the three sacred mountains of Dewa Sanzan and has a height of 1984 meters above sea level. 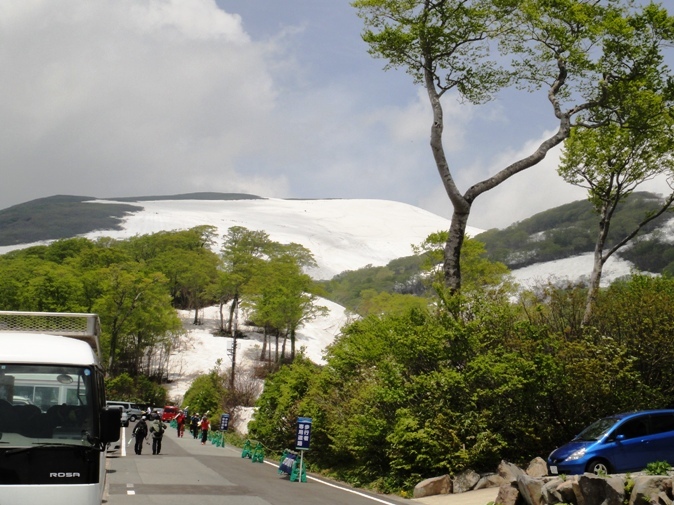 It is one of the 100 most famous mountains in Japan. 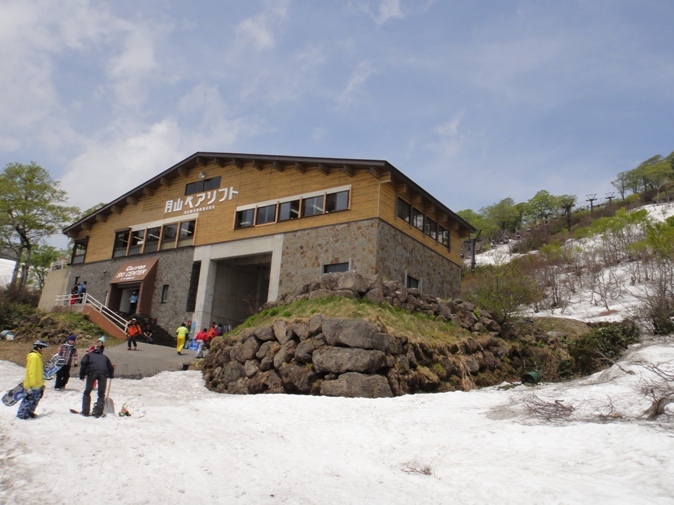 The mountain is located at the center of Yamagata prefecture, and separates inland Yamagata from the coastal Shonai region. 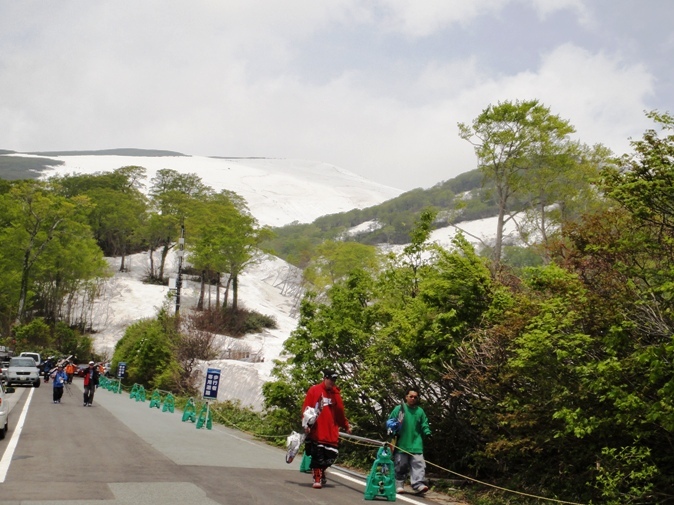 The mountain dominates the scenery from many regions with its imposing size and breathtaking beauty. 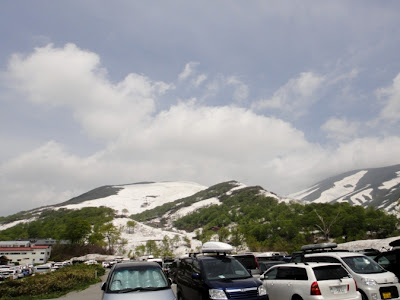 The natural scenery of the mountain consists of a forest of primeval beech trees along with various rare animals and alpine plants. 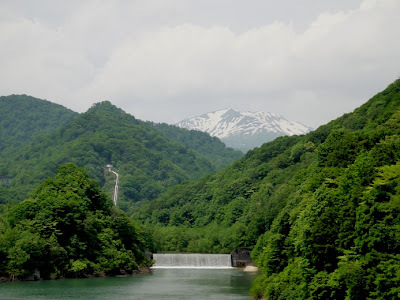 Mount Gassan is a well known place for mountainous faith and religion along with Mount Haguro and Mount Yudono located nearby. 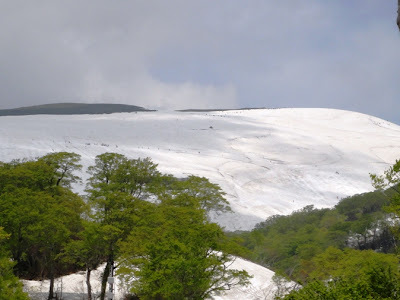 Nowadays Mount Gassan is more famous for skiing and trekking from spring to fall. Mount Gassan is inaccessible for long periods of the year due to heavy snowfall often up to eight meters during winter. Due to this overabundance of winter snowfall, the ski-slopes are not accessible until the end of March. However visitors can enjoy skiing in snowy valleys with remaining natural snow from the beginning of April through the end of July. 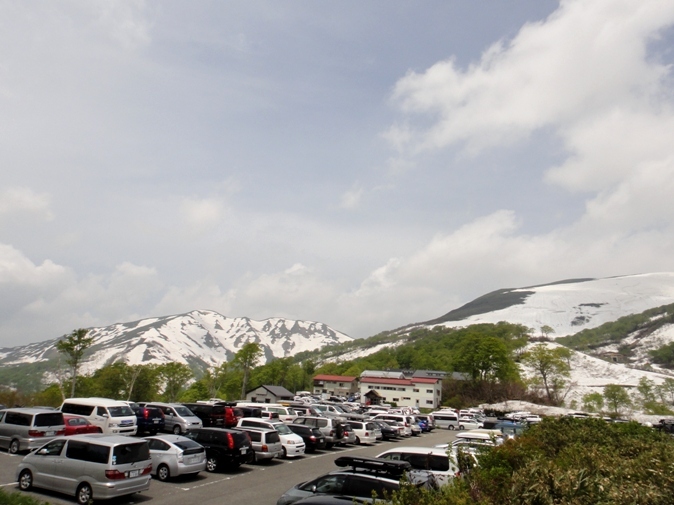 In fact, Mount Gassan is a well known summer skiing spot in Japan. 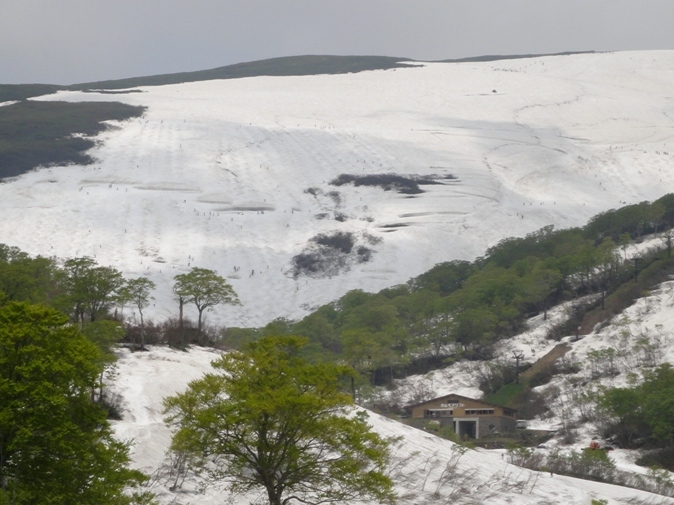 Gassan Ski Area is actually located on a hillside subpeak of Mount Gassan. 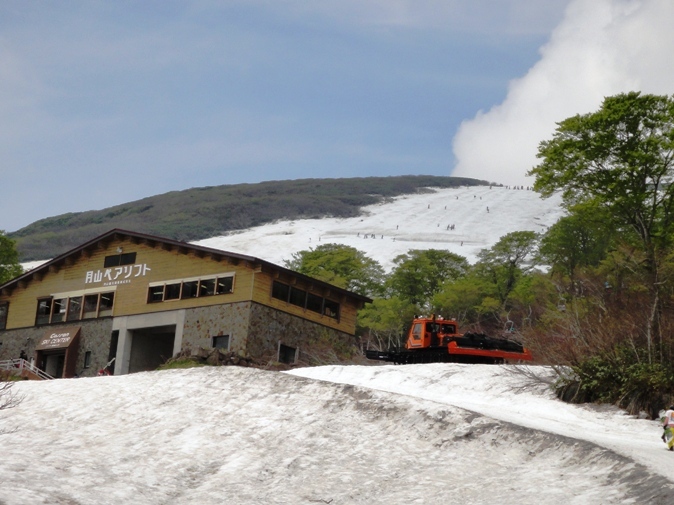 This subpeak named Ubagatake rises 1670 meters above sea level, and has a gentle slope which makes it an interesting summer ski training location for novices as well as for pro skiers. 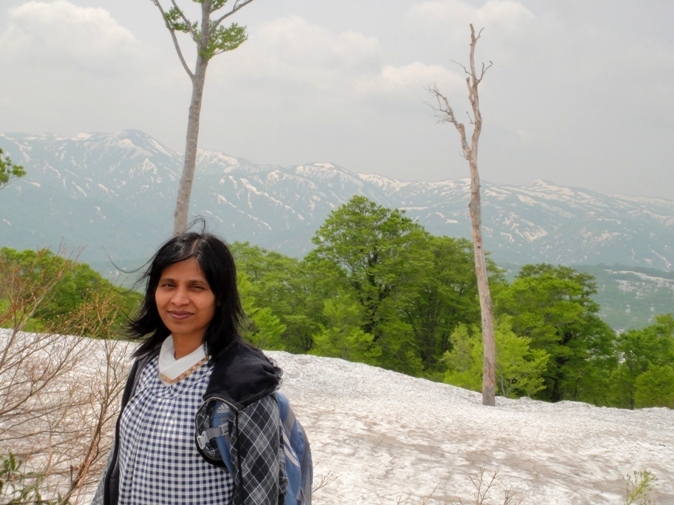 In October 2009 we had visited a five-storied pagoda and a shrine located on Mount Haguro, which is one of the three sacred mountains of Dewa Sanzan. 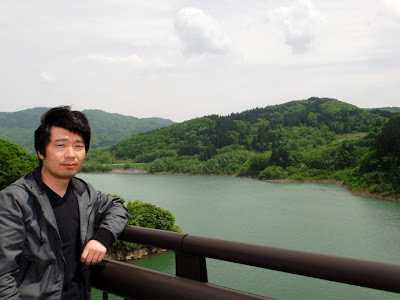 I have written about that visit in an earlier post. So this time we decided to visit Mount Gassan, which is another one of the three sacred mountains. 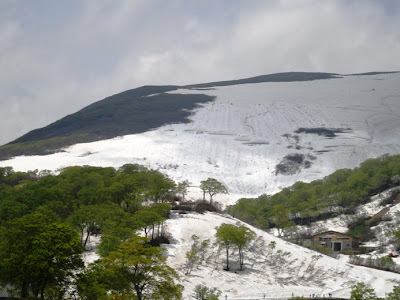 But we visited Mount Gassan to specifically enjoy its natural beauty and not for visiting the shrine located at the mountain summit. We plan to visit the shrine some other time. 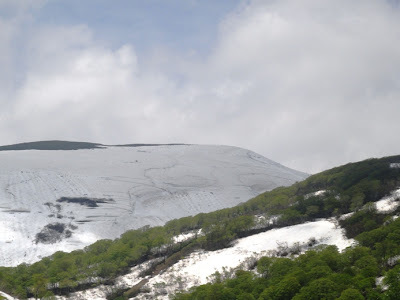 Mount Gassan is located about 140 kilometers south of our home and it took us three hours to reach there by car. 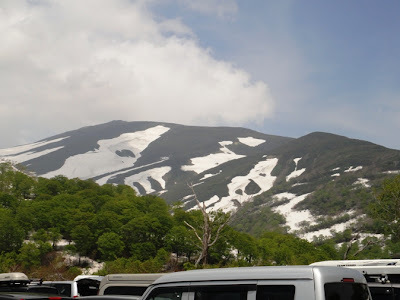 When we were about 10 kilometers away from the base of Mount Gassan, we started seeing beautiful scenery all around us. 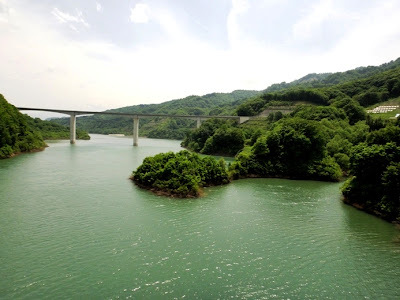 So we stopped our car near a bridge over Gassan Lake and got out of the car to enjoy the stunning views. Beautiful fresh green color of the lake, green forest, and mountain range in the background was so serene and peaceful. 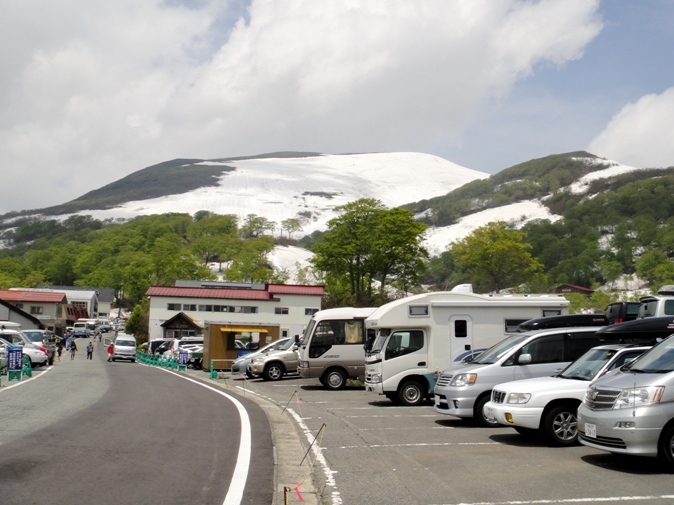 After another 15 minutes of car ride we reached the foot of Mount Gassan. We could drive further from the foot of the mountain till the eighth stage of Mount Gassan where Ubasawa car parking lot is located at an altitude of 1160 meters. We paid 1000 Yen for parking our car. After getting out of the car, we saw Mount Gassan, Ubagatake Peak, and Mount Yudono right in front of us. Mount Yudono has a height of 1500 meters above sea level, and the peak of this mountain is located about four kilometers southwest of Mount Gassan. 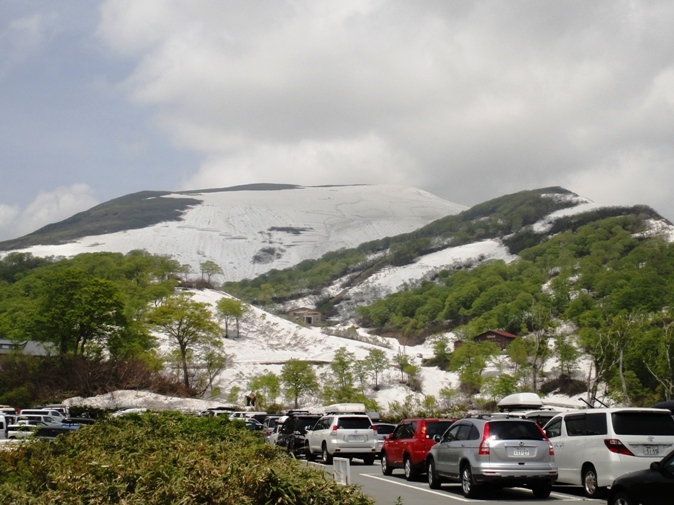 Ubagatake Peak is located to the west of Mount Gassan. We took a few photos of the mountains from the parking lot. Ubagatake Peak is seen just to the left side of the center and Mount Gassan is partly seen on the right side of the photo. 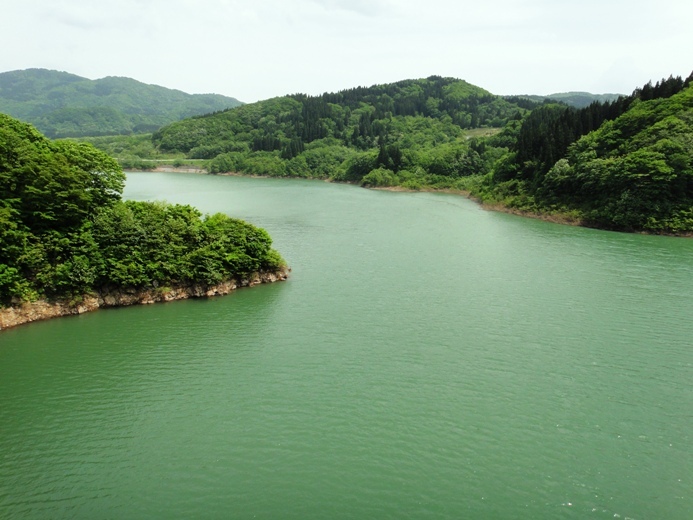 A few hills are also seen in the foreground. Ubasawa car parking lot is rather big and while walking towards the exit of the parking lot, we reached a particular spot from where we got a beautiful panoramic view of the mountains. The scenery was breathtaking. We again took a few photos of the mountains from this position and angle. 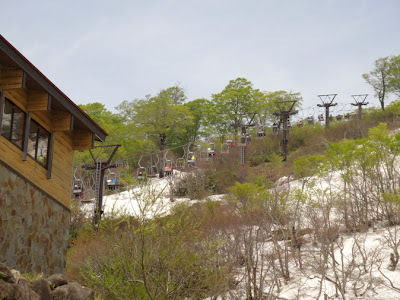 After coming out of the car parking lot, we walked towards the lower station of the lift service that takes visitors to the top of Ubagatake Peak. 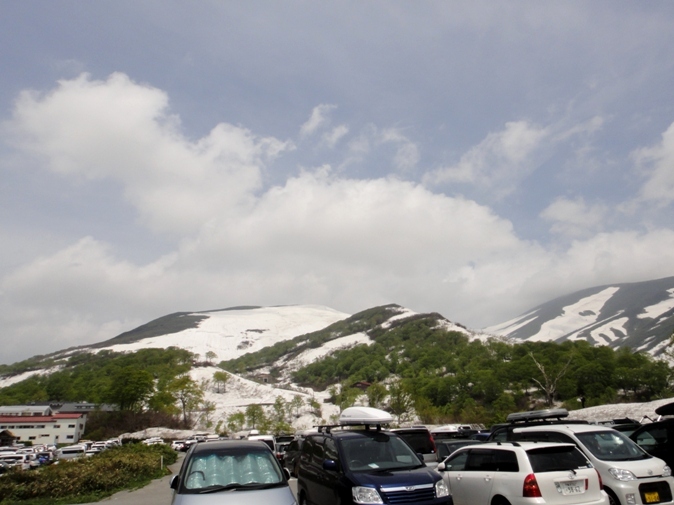 As we walked towards the lower lift station, the snow covered Ubagatake Peak became more and more distinct. 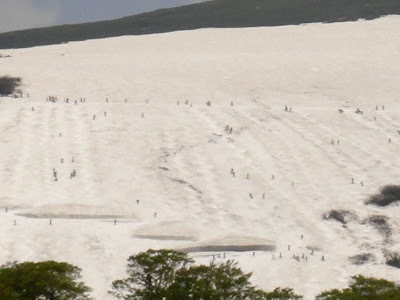 We could see many skiers who looked like tiny dots moving around on Ubagatake Peak. 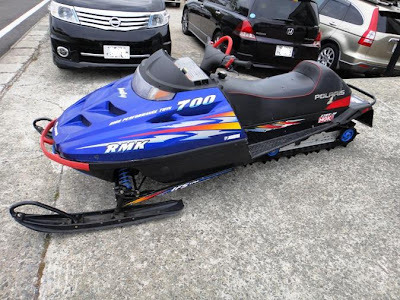 We also saw a few snowmobiles parked around us. 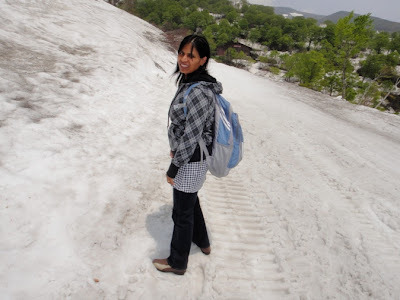 After walking for about 5 minutes, we reached the snow covered area of Ubagatake Peak somewhere at an altitude of 1190 meters. 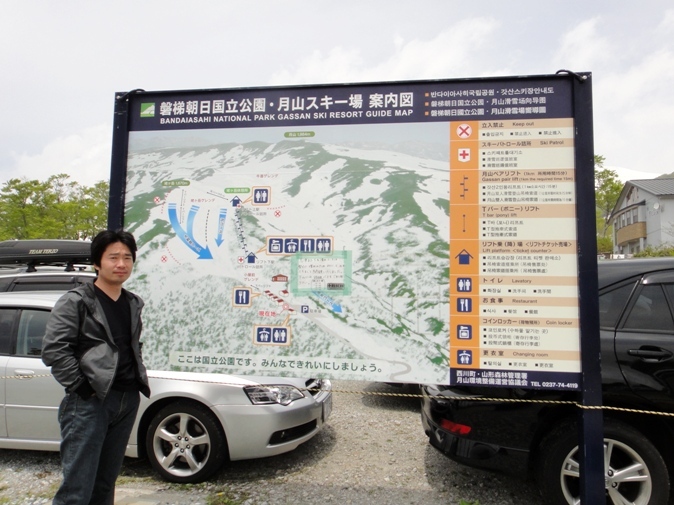 We just wished to see the beautiful natural views around us and did not intend to ski. So we wore summer shoes and did not have ski gear with us. We walked on snow covered mountain for some time. 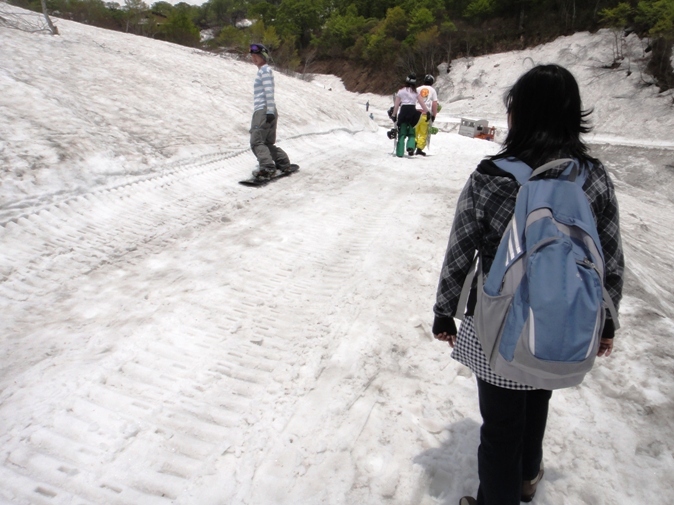 It was a bit difficult to walk on snow with our summer shoes but it was really fun. After about 15 minutes of walking on the snow, we reached the lower station of the lift service located at an altitude of 1240 meters. 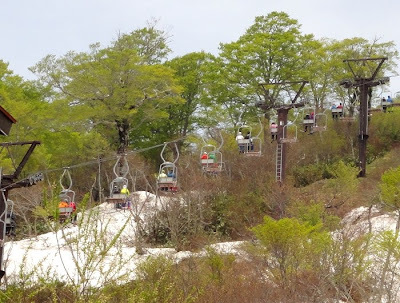 We saw many skiers using the lift service to go up to the top of Ubagatake Peak. 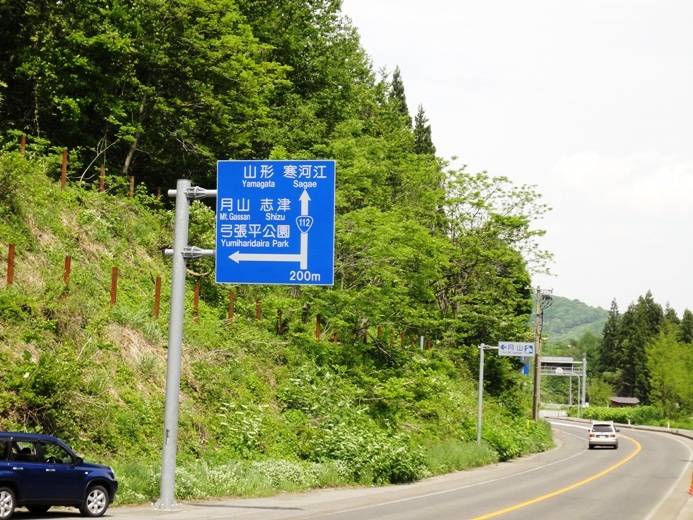 At this point, we turned around and started walking back towards the car parking area. 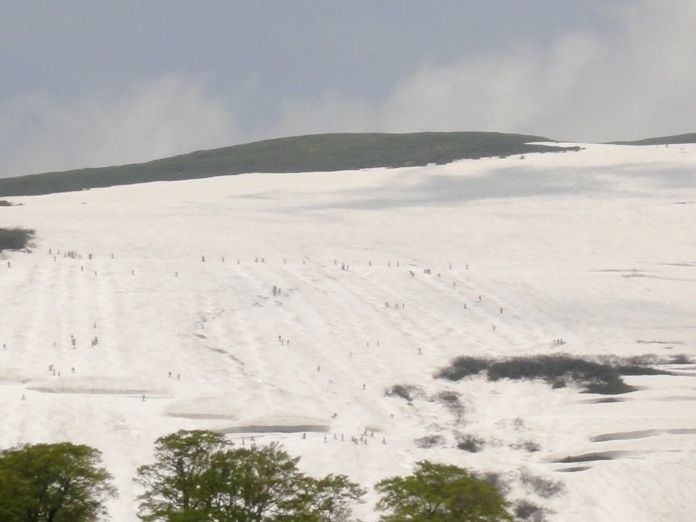 There were many skiers (and snowboarders) returning back after skiing. Hubby got very excited to see so many skiers around him, and so he felt like skiing. Since ski gear hire facility is not available at this stage of the mountain, he just tried to slip and slide on the snow. 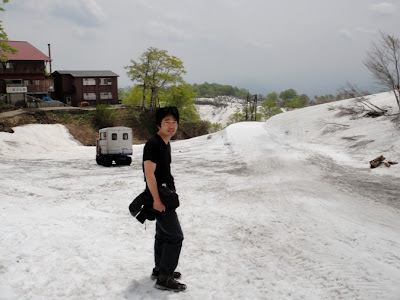 It was so funny to watch him. 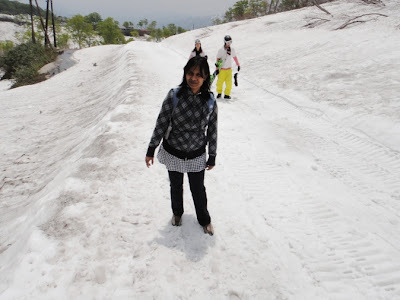 I compiled a video of me walking towards the lower lift station and hubby sliding down the snow covered mountain. Hubby was rather tired after sliding down a small portion of the mountain. 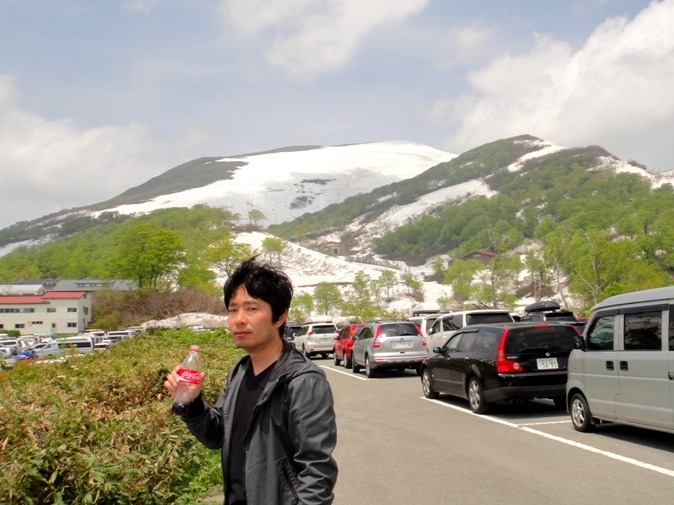 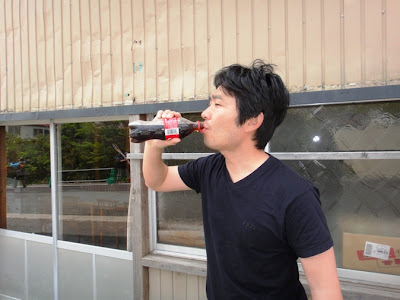 So after returning back to the car parking area, he drank one liter of cold drinks to drench his thirst. 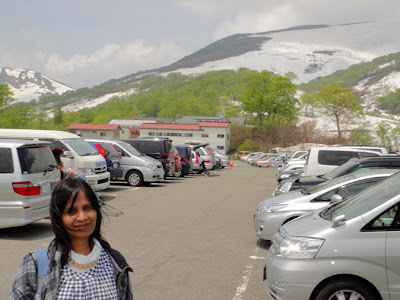 It was really so much fun to visit Mount Gassan. 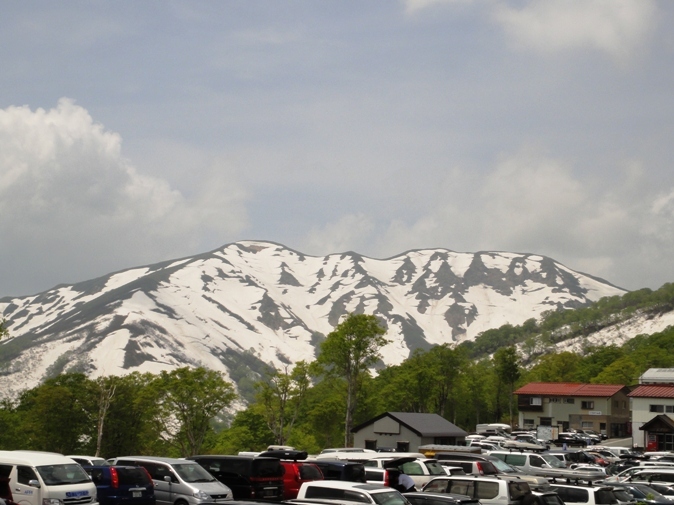 We loved the natural views and the snow covered mountains, and enjoyed watching people skiing and snowboarding in the month of June. Thanks Saru for the comment. 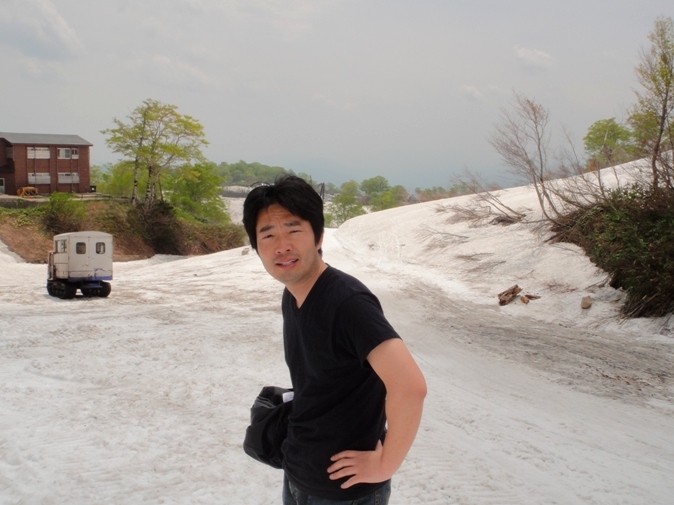 Hope you enjoyed the virtual trip. Thanks Carole Rae for your comment. 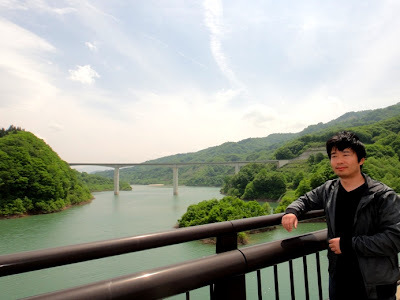 Yeah, it is a very scenic spot and we had lots of fun.